A significant SC24 spot may be in the making | Watts Up With That? Leif Svalgaard (via Frank Hill) writes to advise me that National Solar Observatory GONG is showing a significant spot on the far side of the sun that appear to have the right latitude for SC24 in addition to being fairly large. Here is the GONG plot, note P87. We’ll know soon what the spot coming around looks like and if it has the right polarity or is another one of those seemingly neutral polarity spots we’ve seen over the past few months..
September 15, 2009 in Science, Solar. Come on, Mr. Sun. Crank it up. We are rootin’ for ya. Here comes the Sun….it needs some WATTS! Just wonder why anyone would want the Sun to crank up. One reason you would not is to prove solar activity is the primary driver of climate. How many days out we thinking it is if it holds? As the sun slumbers can we quantify the likely impacts? Nah… it’s going to be a plage. Reply: That’s what you said! [Actually, I’d already fixed it]. ~dbstealey, mod. Latest STEREO image shows something just around the bend. Big deal! The odd spot means nothing. The key is what is happening to the cosmic ray levels – and they are still higher than they have been in decades! Daddy needs a new pair of shoes…and some warm weather? Hm, me thinks gambling on sunspots would be interesting-although tough to set up. This is idiotic…. one spot (may be) showing up and the solar scientists go nuts! It’ll take more than one spot a month to revive the sun. This is slightly off topic but does anyone find it odd that we have not heard from the media about a two foot RISE IN SEA LEVEL along the East coast this Summer caused by the Gulf Stream shutting down? With every Watts there has to be an equal but opposite anti-Watts. With the Watts-Effect there has to be an Anti-Watts-Effect. And there we have it. It will soon fade away quickly because it has been blogged about right here. If it’s that big, how come it does not really show on the holographic image? Is this holographic method not any good? Good, every little bit helps. One spot = n people saved from starvation. PS: Hey! theories are for free these days! just a small untested theory I have! According to our system, the spot is expected to appear on the front side on Sep. 20. STEREO should have improving views as it approaches. Other than the GONG map what makes this look more promising than the excitement spaceweather.com exhibited when they noticed sizable active areas on stereo behind before (like months or years ago)? Try putting Soho on the opposite side of the sun and put GONG and stereo behind where Soho is now and see if you get something that looks like a sunspot over the spotless streaks as of recent. Because that image is five days old. Global Oscillation Network Group (GONG+). Large sunspot emerging, unprecedented weather on Saturn. Note that we also supply a small ascii (text) file that contains the latitude, longitude, phase shift, existence probability, and expected date of arrival on the front side as well. Hope and Change 2009! No ice, boiling oceans, massive hurricanes, earthquakes, dead Polar Bears. And most of all, total Government control of all the people…hum, just like having a dictator or king in power. Don’t count your spots before they have arrived. The hoped-for spot was a plage on the 6th, turned into a spot on the 7th, started blowing its top on the 9th, rotated off the Ahead on the 11th, and is about a day’s rotation behind the 1024 region we had in early July. According to Joe Gurman at NASA, there is only enough bandwidth to get a full stream of one bandpass, and 195 is it.. The EUVI 195’s are not the whole story, sorry to say, and they can mislead. Put them all together, 171, 195 and 284 and you have a very good indication of exactly what is going on up there. I can’t show you that it is currently fading, but 3 days after it hits, if it is faded, I can show you the progression. “The Electric Universe”, or in other words, just WATTS again! This is GREAT!! One Spot. Or it could be desperation. Pores, 2- 2.7 x10E6 LOS area. So I’ll bite; who the blazes is holding up a big mirror on the backside of the sun, so we can see spots over there. I suppose we can put a planet X satellite out there on the opposite side of the orbit; but since the orbit is elliptical, then there really isn’t any opposite side, so there must be a point about half way round the orbit to put a satellite so it wanders back and forth behind the sun, but mostly is visible from earth unless it is too close to the sun. Since the sun subtends about 1/2 degree at the earth, then it would block about a one degree section of orbit on the opposite side, and if it goes 360 degrees in about 365 days, then roughly we go about a degree around the sun every day, but that pesky planet X is going with us, and hiding; so all you orbital mechanicists, about how many days on average is planet X hidden from us so we can’t see spots on the sun’s backside. So maybe we got clever and put a pair of them “Dos Equis” over there, far enough from the blind spot to always be visible, and give us a nice stereo view of the sun’s backside; and any pimples that are on it. izzat about how this thing works ? Oh, man . . . I don’t want to come off as little miss moderator of public virtue here . . . . but there’s a comment above that uses “Jesus Christ” as an exclamatory remark. Trust me. In my private life I use words that I’d not be proud to have aired publicly , but it just seems that this may have slipped past the moderator and should have been ‘snipped’ for the sake of keeping Anthony’s blog classy. I don’t intend this as a criticism of the commenter who used it. Just a little jarring in this forum. Or disprove it. 🙂 Or, more accurately, provide additional evidence pro or con. I don’t think one solar cycle is going to “prove” or “disprove” anything. Backside doesn’t count. That’s what we tennis fans call moving the goalposts. Knowing that a spot is coming around, might that inspire observers to give it a number, even if were too weak to otherwise notice, observational bias and all that? No, they are where they always are at solar minimum. Rock steady, since measurements began in 1952. You have to look at many stations. Just looking at one is like trying to equate global temperature with the temperature in New Hampshire [a la Archibald]. at the same side of the sun tomorrow? You should not read into what I am saying, other than I wanna see some spots. Guess this historic minimum we seem to be sliding into has me a little worried about the unknown. I like routine…so the 11 year cycles work well for me. And while I will leave to the experts as to how much and/or how little Mr. Sun’s variations affect the climate, my wishful thinking at this point is to see some activity. We are in interesting times, for one finite generation to witness such events for the first time in modern times, where sun is being watched like a patient in a hospital with 1000 supercomputers and 1000 doctors evaluating him [Dr. Svaalgard being one of them]. We live in historic times. Somebody please fund these scientists! Money well spent [except for Michael Mann….toss him and his research]. Politicians: Stop worrying about healthcare and the stock market and pay attention to the natural world that gives you life in the first place!! Where we go from here…who is to say?? It would be nice to see some spots, thats all. Biggest worry is a recurrence of 1859…which would knock modern civilization back many, many years [and no one is paying attention to this worse-case REAL and unpredictable scenario]. Second biggest worry is…IF there is a correlation between Dalton and Maunder-type events….to….. I just want some spots. Come on Mr. Sun, wake up [but not too much]. And I misspelled your name again. Sorry about that, Leif. Double a in the second a. Not sure why I have trouble spelling your first and last name. Arggghhh. For that reason, when I reserve a table in a restaurant I use the name ‘Joe King’. And I’m not joking. Mark did not exaggerate. 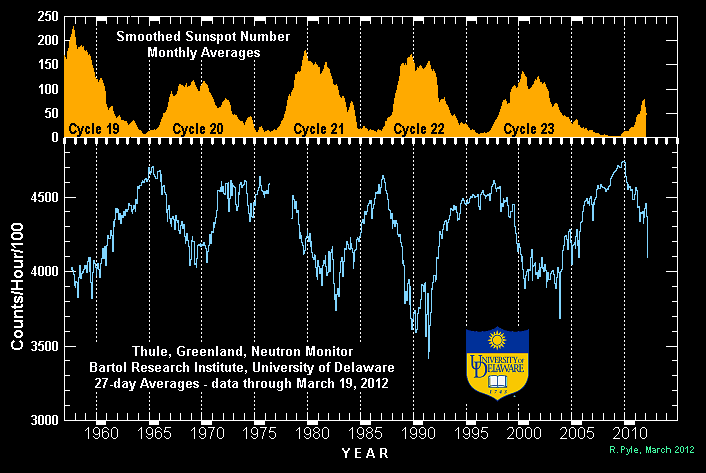 The cosmic rays for all stations are at or above the levels of 22 years, i.e. – decades. And yet, the Sun continues in it’s lack of activity. We are about to go 72 days between significant spots if this rebirth of 1024 holds. How many nickels have to be pumped into the slot machine for the gambler to realize that they are being taken? …so lets hear it for the yet to be named Eddy Minimum. wow, we have to watch the spots on the back side now? count them too you do? huh???? but i thought “they say” It no matters what the sun do,,,,,, it is CO2 that counts!!!!! poem land we go, to visit the word-lings in the land of possibles . Years ago my father’s secretary saved all the misspellings of his name and pasted them onto a new waste-basket. The strangest one was “Piecrust.” My family has developed a high tolerance for such things. Meanwhile, thanks to WUWT we have “sort of” a front row seat to watch the Sun, the ice, ENSO, PDO, SST and a lot of other things in near real time. What a hoot! Thanks to all of you, especially Anthony. So now we are relegated to start considering spots on the far side of the Sun if we can’t get any that actually would have an affect on the Earth facing us. So where does it end?? I’m sure Galileo saw those spots in his day. Let’s count everything and go to a new topic. Leif Svalgaard (18:58:56) :No, they are where they always are at solar minimum. Rock steady, since measurements began in 1952. “Rock steady” only if these extraordinary peaks decrease over the next couple of years. I agree completely. As much as I prefer warmer weather, I would rather the sun go into a protracted period of inactivity and the earth go into a protracted period of cooling, to shut down the AGW industry before it causes any further damage to the global economy. Not to mention that I’d like nothing more than to see Al Gore’s $100M investment in carbon offsets tank. You two seem to be talking past each other. Seems to me – looking at the charts – that the counts go up and down. They have been as high in the past as they are now. So Chris, why do you call the current count “extraordinary”? We all need to be as simple and direct as possible. btw…what’s Gore up to these days? He’s as quiet as the Sun, I tell you. Careful here. Hey, we all would like some poetic justice on the Great Scam. ONE: If the global cooling occurs irrespective of AGW, mark my words that they will say that the cooling is masking AGW. TWO: You really don’t want a little ice age. Crops fail. Plagues thrive. one third of the population perished in Europe during the LIA. There is a reason they call climate optimums “optimum” and there is a reason the “dark ages” are labeled dark. That being said….I share your sentiments…and there is the real side of me that wishes for a LIA or even an IA. “Abnormally high” is probably the more accurate term. They will only be extraordinary if they continue and do not decrease over the next couple years….as I said in my previous post. What I was trying to say is to take into account of the current historic once-in-a-lifetime solar minimum, which none of us have ever personally witnessed, and the fact that cosmic ray increase anti-correlation has been measured but since the 1950s. savethesharks (22:19:34) : There is a reason they call climate optimums “optimum” and there is a reason the “dark ages” are labeled dark. Um, I think there was ONE “dark ages” and most of the cold times are called “pessimums”… Oh, and I think the “dark ages” have an alternative name of “Migration Era Pessimum”. You don’t want to deal with a pessimum. It aint pretty. MySearch4Truth (15:27:15) :[…]a two foot RISE IN SEA LEVEL along the East coast this Summer caused by the Gulf Stream shutting down? Since the next sunspot is significant enough to anticipate rotating into view soon, then this is probably the Solar Cycle 24 maximum that we will be observing. leif’s 500fps electron microscope hovering inches above the suns surface is on a mission to detect sunspots at the atomic scale in 2009. Then he can add them to his chart and get the SS smoothed curve minimum in august 2008 like he predicted. But recently I noticed the TSI and F10.7 in his charts hit minimum around 1 year before smoothed SS minimum in his chart, which is now at least the 4th quarter of 2009. New predictions leif? Good to see another spot trying to show it’s face. While I would lke to see some cooler climate to stop AGW madness, I fear that the sun wll produce a massive CME or super-flare durng this quet spell. The sun’s engine is obviously still running, but perhaps the cooling system has gone to sleep. Waiter (to Lief): Are you Joe King? Lief: Do I look like I’m joking! Someone really ought to tell NOAA’s public relations department that a simple “NOAA strives to understand and predict …” would go a long way toward eliminating some seriously grating hubris at the end of all their press releases. What a grand surprise, a cycle 24 spot! In the next few years, we may get more. So, the GCR intensity is at the expected level for an Odd-Even transition and is not abnormal or extraordinary. This is no mystery as you cannot have less solar activity than no solar activity. They are, in fact, not really constant. (A) seems to be decreasing and (B) is also decreasing meaning increasing CR intensity at the stations. These two variations may for the time being nearly cancel out [because we observe little change], but the cancelling will be somewhat different for different stations [as is also observed]. The net result is that the CR level seems to be rather constant at every minimum. This will, presumably, not last indefinitely. So, you see, the more we know about a phenomenon, the more questions can be raised. Cutting through your insinuations, the smoothed SSN is a poor measure of minimum when two cycles on either side are of different size. And the dashed line is not the smoothed SSN as it does not take into account the next 6 months. The minimum is already behind us and the SSN is expected to rise [not much nor fast, as SC24 will be small]. As you can see here http://www.leif.org/research/Overlapping-Cycles.png the smoothed minimum comes before the cross-over point between old and new cycles. I don’t think a new prediction is in the cards, as the prediction is based of the polar fields since 2003 and they have already made their contribution to the dynamo, so their ‘spots’ are already in the pipeline. He’s not quiet at all. He’s gearing up for an assault – at Copenhagen. He has recently been in Australia signing up specialised “messengers” to be indoctrinated in the spiel. These messengers are then to be sent out to give lectures and provide PR spin and flack to the media or anybody who want’s to hear it. These “messengers” also specialise in going to schools etc to indoctrinate the kids and show that fabulous peace of Nobel winning/ Oscar winning puff peacery. Any wonder that these apprentice “messengers” seem to be Flacks, teachers and so such marketing people. Al’s Apostles. Note – the following is all with tongue-in-cheek. I resemble some of the people described below. Gee, this is kinda neat – as the SC23/SC24 minimum overstayed its welcome, people here got more and more excited about the occasional sunspot – is it SC23? SC24? Oh boy – SC24 is finally here. That morphed into great excitement over any little Tiny-Tim/sunspeck/pore until people finally left the daily SS checks to the truly dedicated (and the rest of use started agonizing over each day’s JAXA update). Now sun spots are so rare we’re excited about one we can’t see for four more days, assuming it lasts that long, of course. What’s next? Perhaps someone can write a model to “project” when future sunspots will appear and we can get all excited over its failings. I sure hope SC24 gets its act together soon – then we can start agonizing over the contrast and temperature of penumbra and umbra as the spots fade into Lingingston/Penn invisibility. I wouldn’t be so confident….we are in waters that you have never transversed. You have stated the minimum was Aug 2008? Oh – I meant to include a note that I was really impressed with the advent of helioseismology and its growth into imaging farside sunspots. Cool science, and I’m pleased that Frank Hill from GONG has taken note of this thread. Hill and Howe are on the leading edge in my view…I know its not easy, but it would be great if we had up to date Doppler views of the current torsional oscillation. Each measure has its own minimum and they vary with up to a year between them, especially when the transition is as flat as the current one. The candidate month of minimum is no earlier than December 2008 according to consensus(!). And without these tiny tims, it is in fact still going. 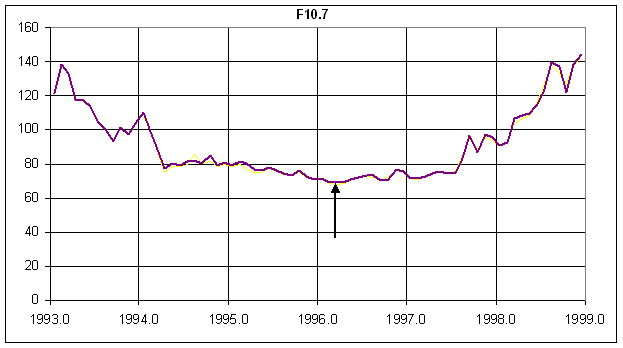 Doesn’t Leif also believe that SC 22 month of sunspot minimum was in October 1996 not may 1996? The images are from 14, 15, 16 Sept.
Take a look at the planetary alignment for 19th/20th. Could this lone spot be due to Mercury passing through on the inside track of the approx Saturn-Sun-Eath-Uranus alignment? Most significant CME/SP events seem to occur near approx transits, double transits or oppositions. The classics are the Carrington event (1st Sept 1859) and Bastille day (24th Aug 1998). Maybe this spot is the result of a similar effect of an otherwise quiet sun. Just a thought without much foundation, what’s your take on this? That Uccle [Belgium] astronomer has a cycle 23 spot on her laptop screen! Take a look at the planetary alignment for 19th/20th. […] Just a thought without much foundation, what’s your take on this? On the other hand, the idea refuses to die as it has a certain appeal to simplicity and predictability in contrast to the messiness of the real Sun, so will always find acolytes. There will always be people ‘in the know’, no matter what the subject is. Modern science has become [simply because we know so much] largely impenetrable to the general public and there is great yearning for simpler [and simplistic] notions. Bastille day was of course 14th Jul 2000. But no matter it and 24th August are both examples of the same thing. Sorry for the confusion. That shows the opposition between the phantoms’ universe and the real one. Between the three dimension universe vs. the n-dimensions universe, that of super-chords, black matter, and other scaring things. The consensus is that minimum is way past Aug 2008….admit it and move on. If you look at http://www.leif.org/research/Active-Region-Count.png you can argue that minimum was in May 1996 according to smoothed SSN, or October 1996 according to the sharp dip in the red curve down to very low values, or in January 1997 according to the cross-over between cycle dominance, or in March 1996 according to F10.7 http://www.leif.org/research/F107-1993-1999.png , or in January 1996 according to the minimum ’tilt’ of the heliographic current sheet, or in …. No, it is just that the image is mirrored because of the projection. That speck does indeed coincide with the SOHO speck. The consensus operates with a +/- six month window. Accept and admit that the minimum depends on the criterion, and move on. Ahh… didn’t know the host liked his puns. Encouragement! I would like the sun to ramp up a bit… I am all for a bit of warming. I live right smack on the 45th parallel. This means two things. 1) Most of the continent is North of me 2) I am freezing. We had 6 full months with temperature average far below freezing in the last year, and nearly no summer for the second year running. To us warmer means better growing season, more rain, less money spent on heating, the list goes on and on. Perhaps a little more on this? Or a direct answer to George Smith’s question: How do they see spots on the farside? Thank you for the link to that paper, excellent. I completely agree. Maybe CO2 based AGW is part of the same yearning. Note: Square brackets don’t work here. For HTML use arrows: . ~dbs, mod. The roiling and vigorous movements in the Sun create sound waves that [like seismic waves] propagate through the entire Sun. A big sunspot’s magnetic field changes the speed of sound in and around it, thus changes the time it takes for sound waves to reach the front side, where we observe the waves as oscillations. We are basically observing [or deducing] the variation of the speed of sound inside the Sun, and can thus tell if there is something [like a spot] changing it. That is not how the Sun is behaving these days, Leif. Cheerleading the region will do nothing for it. It either survives the tendency to wither going from the BEHIND to the Earth LOS or it does not. The region to the north of it didn’t fare so well. Not much does, therefore the odds are not good. The gray image is an average of two 24-hour maps, the orange image is a single twelve-hour map. The gray one has a reduced noise level, and only phase shifts that are present in the same location for 48 hours survive. Those that survive are deemed to be likely real active regions rather than noise. A probability level is assigned based on the strength of the phase shift and the persistence of the signal. We have set up a beta site with the gray images, but the original site has only the orange ones. There is no “manual” editing at all in the process. The software to create the “grey” (calibrated) images has been implemented to average two daily non-overlapping images, then check for local minimums above a particular strength and finally the strength is compare to statistics that we have created for the success rate. If the probability for that particular signature is above 70%, the local minimum is highlighted as a candidate (in red circle). The statistics have not been published yet (although they are on their way). The averaging of two consecutive maps makes all the short term noise (solar or otherwise) go away. I talked to the space weather forecasters some time ago and they were happy to lose temporal resolution if that meant to increase the reliability of the maps. This is all exciting stuff. Science in the making. which was posted here awhile back, elicited a few scornfull comments. (Don’t remember why) I’m assuming this “ear to the sun” technology is the same to which you refer? Yes, I don’t know what it is about a scientific nature: BRING ON THE ICE AGE!!! And why can’t we have a few of those great big lightning storms like they have on Saturn? We’d cope. We’re good at that sort of thing. I’m assuming this “ear to the sun” technology is the same to which you refer? It is, and it isn’t. The farside look is a separate application of helioseismology. some of the differences are due to varying ‘duty cycle’ of the GONG network [how much data is collected – clouds are sometimes a problem 🙂 ], and the very clean signature that heads this article had the very best duty cycle [99% and 100%]. …. We are basically observing [or deducing] the variation of the speed of sound inside the Sun, and can thus tell if there is something [like a spot] changing it. Just wanted to point out that our current far-side method results in a reduction of the signal as the active region moves across the analysis area, so the signature gets stronger and weaker at times. This does not necessarily mean that the sunspot is actually changing (although, of course, it may be). We have a new method in the works that will reduce this effect. Just a quick comment to clarify that the original idea to map active regions at the non-visible disk of the Sun by analyzing waves observed in the front side was developed by C. Lindsey and D. Braun. Lately we have been working on improving the signal to noise and made the maps more reliable. Hence this new “calibrated” product. Note: The seismic signature of the active region as it moves across the far side varies, not only because the active region changes, but because the method is more sensitive to certain locations than others. So we expect to see the signature fading away and sometimes coming back even if the active region is very stable. But it is still going strong on STEREO B images. And Frank et al. might have already posted the explanation for the disappearance: that the signal gets weaker closer to the limb. It looks to be still there on EUVI 195, but that is not the only band for STEREO. It just happens to be the one they picked for thier investigative purposes. You are looking at 1/3 of the total picture. Hmm, http://soi.stanford.edu/press/ssu03-00/backside.html should be the place to start, but a link there to lindsey.pdf is broken. The Sun shines in very many wavelength bands [sorta infinitely many], but a big spot is visible in them all, so 1/2, 1/3 of 1/1000,000 makes little difference. Or perhaps you missed the point: There are 3 Fe bands to STEREO, not 1,000,000. And the range is 17 to 30 nm. First, this event is being played down for some reason. We’re talking about an unprecedented (albeit temporary at this time) rise in sea level (of up to two feet – flooding and all) from Maine to Florida. There were no storms or even high pressure systems to blame. Wind is a flimsy excuse – it was due to a partial shutdown of the Florida current (FC) which is a major contributor to the Gulf Stream. If we want to ‘discover’ things we’ve got to be able to see the forest through the trees. This event implies that ‘The Pentagon’s Report on Abrupt Climate Change’ may have been spot on. Delving into this would be a great story and a great contribution to this debate. Two feet of sea level rise and scientific evidence it was not due to man-made global warming. Seems like the perfect topic here. I’m baffled. Or perhaps you missed the point: There are 3 Fe bands to STEREO, not 1,000,000. And the range is 17 to 30 nm. My point is that it doesn’t matter how many bands there are; you will see a strong active region in any ONE of them, or two, or three, or whatever many. So, we are not seeing only 1/3 of the story. The other bands tell the same story. The great surface currents of the oceans are chiefly driven by the actions of the winds. Seasonal and unseasonal changes in wind strength alter both current flow and sea level, and temporary variations in wind patterns occur from time to time for reasons we do not completely understand. This was no major event, just a minor fluctuation and it has probably happened many times before, yet it is so trivial nobody made anything of it back then. It is only today with 24 hour news ever eager to to report anything and everything that it achieves some kind of fleeting prominence it does not deserve. And credulous folk think they see some kind of pattern in random variation which does not exist. Put the link in the Tips and Notes thread , Top bar right. I agree it sounds interesting for the blog. Right with you there, Mike! How can you say that when I have provided scientific evidence from NOAA of all places suggesting otherwise? Not to mention the Pentagon report on abrupt climate change and the (only media story) article by National Geographic. To the contrary, this very compelling and unbelievable story has been suppressed, not sensationalized as your knee-jerk response would imply. Is there ever cause for alarm and concern in your line of thinking? No, you are patently wrong here as the event was unprecedented and there is no Maine to Florida occurrence of any such event on record. You have your eyes wide shut. If you want to blow me off, bring something better than that. Mysearch4. The link you post is typically not what you say; it is a hypothetical scenario not a prediction. I would like to see your proof that any event seen recently has never been seen before (patent nonsense) or in the incredible event that you can actually provide backup, proof that this was in any way caused by man made CO2. I won’t hold my breath. If you think I am pro AGW, you’re nuts. I can bet I have been fighting this fraud longer and better than most people here. So what are you fighting? This forum is not a good one to vet issues. The only responses I have received are from people mistaking me for the opposition when this is not the case. From experience I see this as a rather disturbing majority related to the issues at hand. People are so politically charged they lose sight of the fundamentals. We are searching for truth and promoting discovery, not hunting down Nazi’s and arguing every point which may not fit into our (think about it) narrow perception of what is going on. Don’t hold your breath on me proving man-made global warming because it is the greatest fraud in history. I won’t hold my breath for you to see real trends emerging that are related to a potentially abrupt shift in climate that is natural. You can just sit there thinking GWers are insane and everything is going to be A-OK.
During June and July there was a rise in sea level ranging from .6 to 2 feet from Maine to Florida… This event is unprecedented and significant because it was due mainly to the Florida Current losing steam… the Florida Current feed the Gulf Stream. This is a National Security issue which is why we haven’t heard about it…. I at least thought we would here. I have said my peace. I have fought in opposition to the fraud of AGW long enough to not have to explain myself to people that don’t take the time to figure it out. The sea level rising two feet along the Eastern Seaboard during June and July with no precedent serves the agenda of skeptics. With such a measurable and unexplainable event, why aren’t the AGW crowd and the media jumping on it? That is the question. I know why. Do you? This is interesting. There were reports earlier this year of a 1 foot rise in the water off Eureka, Ca. I had not heard of the 2005 scare. > If you want to blow me off, bring something better than that. Someone who hasn’t figured out the “Tips & Notes to WUWT” deserves to be blown off. I confess I haven’t followed your distraction, so if the link refer to sunspots on the backside of the Sun affecting the Gulf Stream, feel free to blow me off here. Otherwise, make it a “Tip and Note,” please. My search4, two things. I speak English so understanding you is difficult. Secondly the event wasn’t unprecendented nor caused by any shift in climate. Nor is it National security or even laughable conspiracy theory. It was caused by a combination of three natural events one a perigean spring tide, the second a strong NE wind and thirdly a perfectly natural change in current. Sea levels 1.6 to 2 feet above predicted are not unique events. Thanks for the links. Most interesting. The signature is back and strong in the seismic maps, since the location in the far side disk is now out of our 2x2skip and 1x3skip merge area. We use different waves to map the central and peripheral part of the non-visible disk. The central part is calculated using waves that bounce once at the surface before arriving to the front side, and the outer part is a combination of waves that bounce either none or two times. Finally, there is an area where the signals are merged. Each of the parts has a different sensitivity function. The duty cycle also plays a role. The signature depends on the amount of data, but also on where the gaps are located. If this AR were close to the equator, and assuming it stays strong, the signal should continue to be strong in the farside maps all the way to the limb, but at 30 degrees latitude the front side observation “pupils” are irregular and I’m not sure of how the sensitivity will vary. It’s entering the ‘Snuff Out” zone. Same thing it did on July 22nd. Doesn’t look any healthier to me at this point. What else do you have that says ” aha, this time it’s different” ?? How’s your flux level from then & now? I was comparing with 1024 [July 4th fireworks]. That one lived for a week+. If 1026 [probable NOAA number] lives that long it should make it to the front, but decaying. The flux level just before 1024 was the same as now. Here is a comparison of 1026 East Limb (Behind) and 1024 East Limb (Ahead). http://www.leif.org/research/1024-1026.png 1026 looks a good deal better than 1024, so might live longer, that’s why “this time is different”. But we’ll soon know. I was comparing with 1024 [July 4th fireworks]. That one lived for a week+. If 1026 [probable NOAA number] lives that long it should make it to the front, but perhaps decaying. The flux level just before 1024 was the same as now. When I followed your link it remnded me about the theory that there is more volcanic activity and tectonic plate movement at solar minimum. I also remember reading somewhere that the Mid-Atlantic Ridge is growing and tectonic movement is raising the Atlantic seabed. Putting 2 + 2 together = 5, could a growing ridge be partial blockage the Gulfstream and be causing changes to the paths of deep undersea currents? I’ll try to dig up some more information on what’s happening now. As long as we keep in mind that STEREO B has traveled 7 degrees backwards in longitude, and that means a full 1/2 day further rotation wise, it’s going to look stronger per se being that much more around the backside. Yes, it may make it, or it may not. We should not be so trusting of the Sun, considering the behavior. lest it dash hopes once again. MySearch4Truth (19:44:24) : First, this event is being played down for some reason. We’re talking about an unprecedented (albeit temporary at this time) rise in sea level (of up to two feet – flooding and all) from Maine to Florida. Persistent winds and a weakened current in the Mid-Atlantic contributed to higher than normal sea levels along the Eastern Seaboard in June and July, according to a new NOAA technical report. So an important part was wind, and it isn’t all that unusual. And a “special” tide pitched in too. OK, so some unusual wind and tides. Who knows what influenced the current to slow down. It would be interesting to see if it has picked up speed again as the wind and tide oddities have moved on. After which, within a day, 1024 began to fade out, sending out it’s last streamers. And by then it had lived 20+days. So if 1026 does that too, we should be fine. [PS I was wrong upthread when I said 1026 had lived longer than 1024 – forgot to count the backside traverse.]. I bet $100 that 1026 makes it to the front and gets numbered. Thank you very much for sending this comparison picture!! I have been looking for a similar example myself. You have saved me a lot of time! I know we have not detected candidates for the new cycle in the far-side seismic maps yet, but I was curious about STEREO having similar signatures to this one. I found the farside maps for that particular period (0720 to 0729) and there is no signature of that AR in the seismic maps. Nothing strong and persistent there to be considered a candidate. This means, the photospheric manifestation of this new active region is larger/stronger. Of course, that doesn’t mean it will persist for very long, but probably longer than the other one. No signature in the far-side maps even soon after it rotates to the far side. First image is SOHO Frontside. I call these CEIT, or Color-Composite EIT images. Note the reddish tint to the Tiny Tim and it’s relative size. 2nd image is STEREO Behind, where our much-awaited region is spouting off. 3rd image is STEREO Ahead, where you see a Tiny Tim on the Equator. The STEREO images are only 4.7 days rotation apart, Ahead to Behind., from limb to limb. The only caveat with these images is they are up to 3 days behind the current date. Can’t have everything you know. Robert, these are indeed very nice. I’m sure you’ll [in due time] capture 1026 in all its glory. They are meant to be informative, but the credit has to go to NASA for picking the bands to get the Iron out. One needs only calibrate them with visible spots and flares. It’s the next best thing to having a SOHO MDI Ahead & Behind. This one still have not appeared on our side. Has it fizzled out, or has it just not come around yet? When can we expect to see this one? The initial timing of 1024 is different from “1026”. 1024 formed quickly at about 8 o’clock on the front side giving us its rise and fall in all its glory. “1026” was forming as it went off the front side and is still with us, but is it on the downslope? If not it has some beef. Well, it’s not a whopper (yet) and it’s not the sharpest tack to project, but it’s here. Soho site power outage over the weekend, looks like they still haven’t updated the image from Friday the 18th. I’m impatient, I want to see the spot!! Another source for near-real-time solar images is Solar Monitor. They have two pages that show images from several sources, including STEREO, SOHO, Hinode, and ground-based observatories.